This fix, I asked my stylist for tops to wear with my blazers and cardigans, since that is my work "uniform" and I have a zillion dresses. My stylist focused on printed tops to go under the solid top layers I mentioned, so they could really pop. She also included a dress and a cardigan. 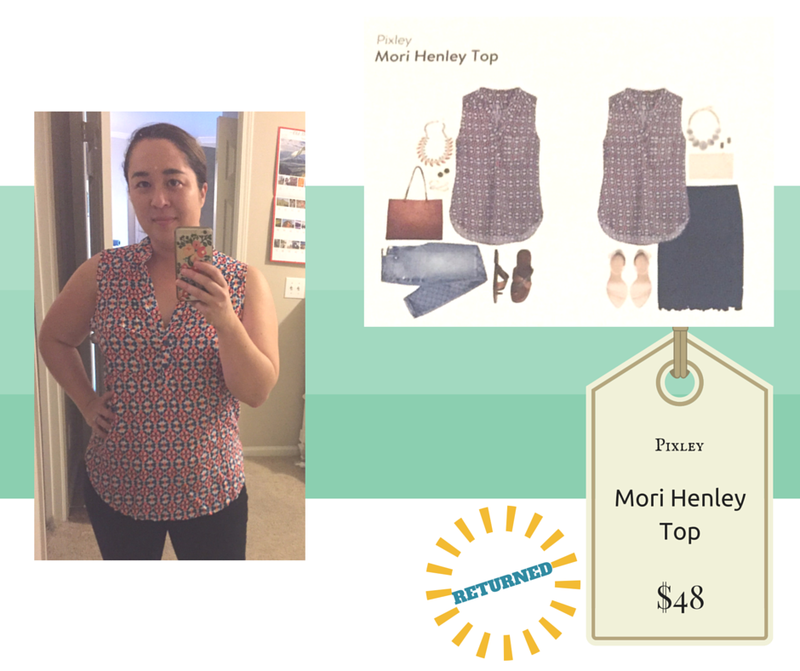 Sydney, my stylist, reads my blog recaps and uses my Pinterest board to make decisions for me, and I've noticed that over time she's really good at picking items that I would certainly consider and try on, as well as a lot that I want to keep! While I was initially hesitant to love a dress that appeared to be named after Edward and Bella's vampire hybrid baby from the Twilight series (that name! ugh!) 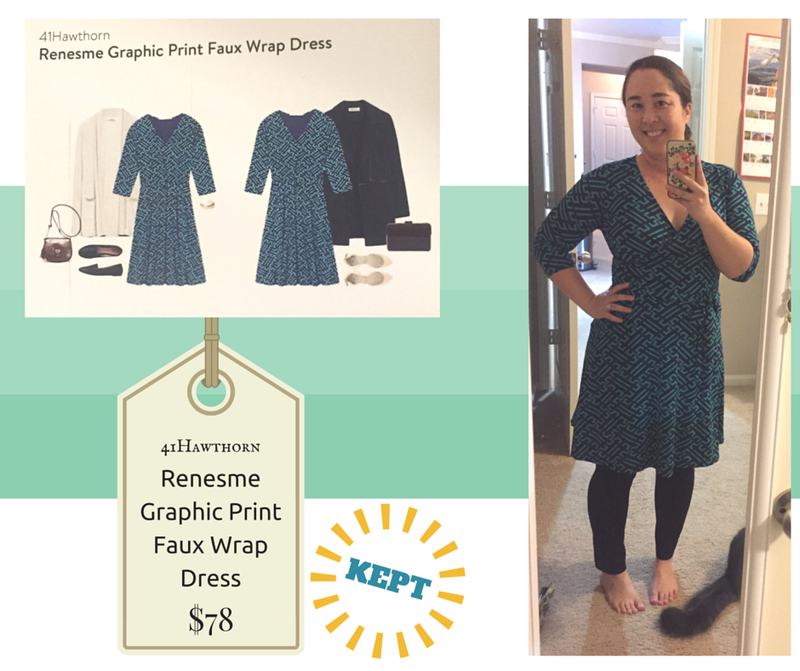 I know that wrap dresses, even faux wrap dresses, are incredibly flattering for just about any woman. My boss has a DVF wrap dress that I've swooned over a few times, and this one made me swoon too. 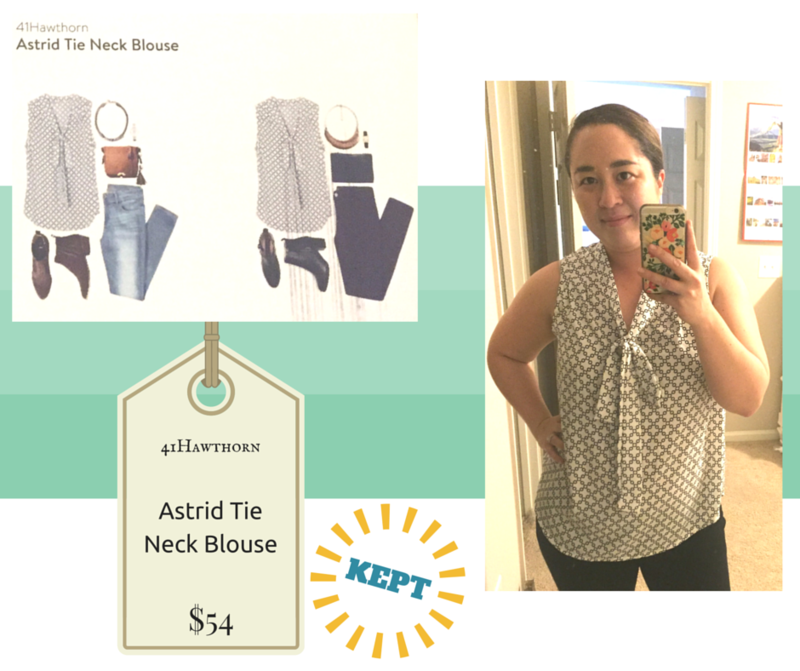 The material is great, the color and pattern are perfect for both office and date night, and it hugged my curves in the right ways! I couldn't help but keep it, even though I probably need to go through a dress purge in my closet. And I think that if they keep sending me this dress in future Fixes, I'll keep it every time too, #likeaboss. I liked the print on this top, and fabric was super soft and comfortable. But for some reason (you can't tell in the photo) the neckline really plunged on me, and it didn't quite match some of the existing cardigans/blazers that I have as I'd like. I decided that this top was a "maybe" if I liked everything else in the fix, something I would definitely end up wearing if it was in the closet, but not a new favorite. Since I ended up sending items back, this went back too. The bow detail on this cardigan's sleeve had me swooning, and my stylist has learned that I love crew-neck cardigans vs. v-necks! But I have a cardigan from J. Crew Factory almost exactly the same color, so I couldn't justify keeping it. It is perfect for me, I just have a duplicate. 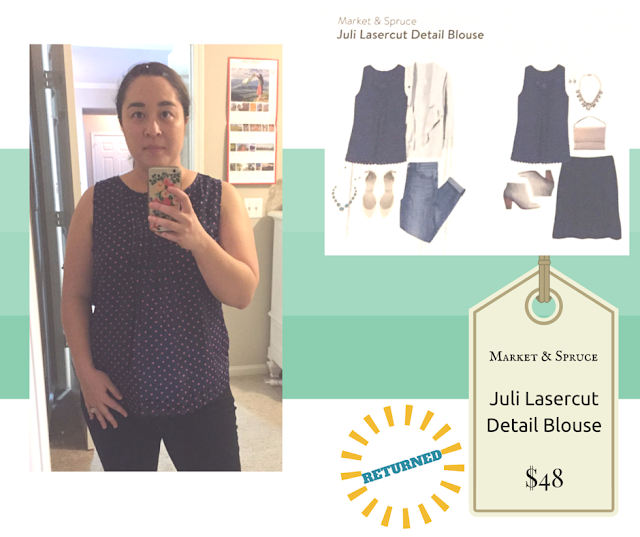 While I loved the dots and laser cut details on this blouse, the fabric didn't have a lot of give (I test tops by moving my arms around like I'm swimming LOL) and I don't wear a lot of navy tops... 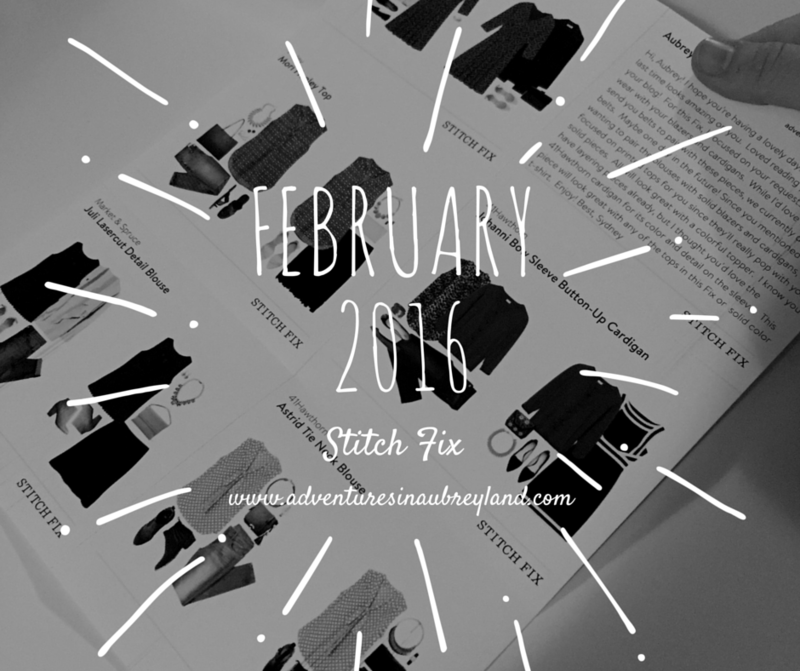 I think that's because I wear jeans often, and navy over jeans sometimes feels monotonous. This was probably my least favorite top, but if the colors had been different I would have been tempted to keep it. The tie neck blouse jumped out to me before I even before I tried it on. I just love how these blouses look both with a suit or over jeans with a cardigan! I would like to have more blouses like these, because to me a tie-neck blouse is kind of the equivalent of a shirt with tie for guys. Some people call them secretary shirts, but I like the vintage throwback. 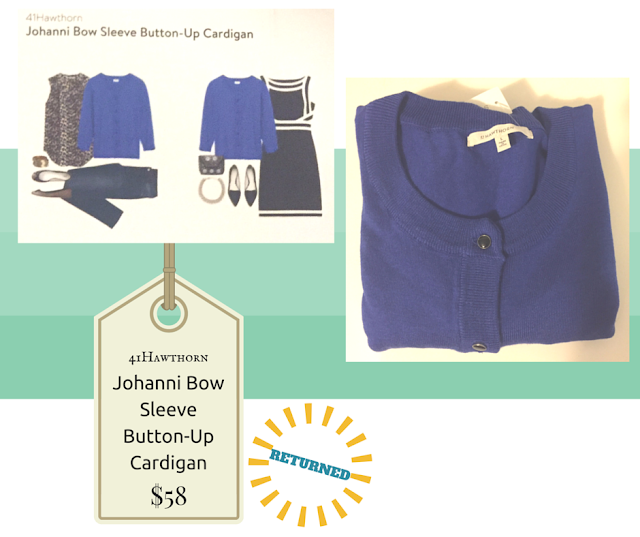 I've realized that I do like to receive my Stitch Fix, even though the prices are more high-end. Over time, my stylist has gotten to know my style pretty well, and it pushes me to try something that I normally wouldn't. While I have let go of some of the pieces I've gotten in my Fixes, especially since women in my office have gotten multiple duplicates of items I've received, it's kind of fun to see what comes next. I've rescheduled my Fix frequency to every three months.